The 4.55m saltwater crocodile caught by Northern Territory rangers this week was a monster. The thought of the damage he could do is sobering. You wonder how dull life in the Territory can be if people have to resort to planking on crocs to brighten things up. Previously, we took a look at the infective consequences of shark bites. Now we examine what damage a croc can do. Here’s a microbiological perspective on crocodile bites. 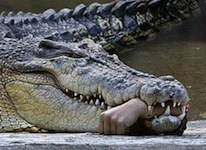 How a crocodile bites: Crocodiles and related species (alligators, caimans etc) have bite strength in proportion to the length of their jaws. Long snouted species are suited to swift lateral attacks, while shorter snouted crocodialians are more suited to a grasp, shake and roll attack. Strong, swift lateral attacks on the extremities cause decapitation or limb amputation. Other extremities can also be attacked – men beware. Clearly decapitation is swiftly fatal. Traumatic amputation may not be if the victim can somehow get immediate life-saving medical attention. If the victim of a crocodile attack suffers a lesser injury, there is a substantial risk of wound infection. The bacteria cultured from crocodile bite wounds include Aeromonas hydrophila, Burkholderia pseudomallei, Clostridium species, Enterococcus species, Proteus species, Pseudomonas aeruginosa. Interestingly, in one study of crocodile intestinal bacteria no Salmonellas were found. The fungi commonly necountered in that series was Cladosporium sp. Crocodile teeth are peg shaped and may harbour a flourishing resident bacterial flora. Unfortunately the data on the composition of that flora are limited. 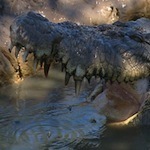 Other sources of bacteria contaminating crocodile bite wounds are likely to include the water in which the injury occurs and the bacteria present on the skin surface of the victim. A wide variety of potential infective agents can therefore be expected. Prevention: best summarised as avoiding crocodile encounter by any legitimate means. The largest single mass crocodile attack is thought to be the result of a hasty retreat by Japanese troops through crocodile infested swamps in the Battle of Ramree Island during the Second World War. Where ? 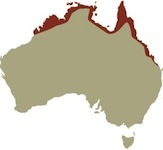 No systematic surveillance of crocodile attacks is available in the form of easily accessible mapped data, however the Australian risk zone is restricted to the northern coastal area .